A good anti-rush card, not that many non uniques have 2 I icons so getting this early against Misk can mean he takes another crucial turn to win a story. And a lot can happen in a turn. Worth a look for sure in a mythos night deck. 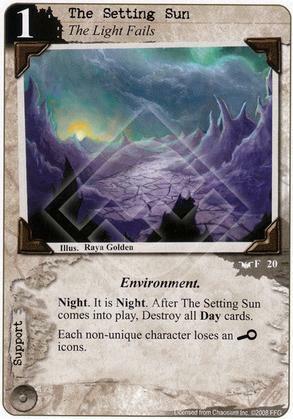 I like this in a longer-game control build, but as with The Rays of Dawn, the non-unique restriction is pretty awkward. I think I'd rather run removal in general, but at 1 the price is right for this sort of effect, especially if it buys you an extra turn. A first turn play against a MU deck goes a long way towards winning the game, this will have some use against any human faction. This is an answer card to rush that is worth consideration, whether to include it in your deck is a meta call. Silver Twilight Temptresses work best under The Setting Sun.